And the Anonymous Nobody is an album that was destined for greatness but failed to live up its potential. Among the various hip-hop acts that became the Native Tongues in the early '90s, De La Soul are easily the longest lasting, and it’s easy to see why. While other groups at the time focused on social commentary and jazzy instrumentals, De La Soul never had one such singular focus. Years after A Tribe Called Quest called it quits in the late '90s, Posdnous, Dave, and Maseo spit bars on Gorillaz’s debut album, a blend of indie rock, hip-hop and electronica that could not be farther away from the Universal Zulu Nation of Afrika Bambaataa. Most of the time, their experimentalism paid off, but at other moments it left some albums underwhelming. An album that falls into this latter category is And the Anonymous Nobody. The problem with this album is not that it lacks any defining moments, but that those moments are drowned out. Each track feels the same as the rest, no matter whether the song deals in love, politics, or culture. This is partially due to the funky aesthetic tinged with jazz influence, but it is also a result of the same delivery by the hip-hop trio on every song. While De La Soul are known as hip-hop’s answer to the flower power hippie culture of the '60s, their usual vibrancy, liveliness and personality is worn on And the Anonymous Nobody, making the album not fun enough to party to but also not serious enough to be taken too seriously. It falls in that mysterious gray area, fallen between the cracks. That being said, plenty of songs are great on their own. “Royalty Capes” feels epic and grand, with a horn section and lyrics that remind one of the movie Gladiator. This cinematic sound continues on “Memory of…(US)” as a string section adds to the atmosphere of the song. Besides the production, however, are also a handful of guest artists that come through with some of their best verses in years. Two particular examples are Snoop Dogg on “Pain” and 2 Chainz on “Whoodeeni”, where the former sounds less high and more focused while the latter sounds less comical and more grounded than he’s ever sounded before. However, for every good song on this album, there’s a dull or mediocre one. “Greyhound”, besides feeling campy with bus noises interspersed throughout the track, also sounds too forced as De La Soul essentially make their own “Brenda’s Got a Baby” in the most overblown way possible. “Trainwreck” lives up to its name with some obnoxious cowbell, and “You Go Dave (A Goldblatt Presentation)” fails as a skit to deliver on the comedy and concept it promises. 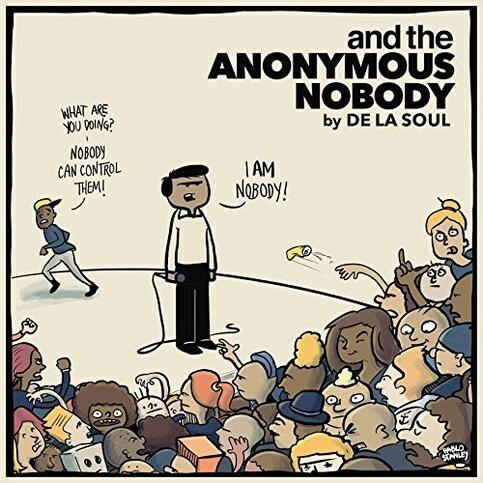 With songs like these, And the Anonymous Nobody seems like De La Soul throwing everything they have at the kitchen sink and linking these random thoughts and feelings through funky instrumentals. It’s not as if they were short on material; if only a third of this album were cut, the trio would still have been left with a decent twelve or thirteen track album. For an album that tries to sell itself as being put together and well-thought out, And the Anonymous Nobody only leaves me feeling disappointed. The production they chose was great, many of the singles were excellent, and the album name and cover art promised a quirky, fun concept with more profound undertones laced for good measure. By all accounts, De La Soul should have had this one in the bag, but instead their inability to trim the fat out of this album lowered its overall message and purpose, if there was ever one to begin with. There are enough highlights to make And the Anonymous Nobody worth revisiting, but as a whole, the album is just barely above average. A valiant effort, De La Soul, but no dice on this one.